The Hon Justice Paul Stein AM served as a Judge of the District Court, Land and Environment Court, and Court of Appeal of New South Wales. Amongst the many contributions he has made to the law in his distinguished judicial career, one of the most significant is development of the jurisprudence on ecologically sustainable development. Through his judicial decisions and extra-judicial writings, the Hon Justice Paul Stein has articulated and implemented the principles of ecologically sustainable development. 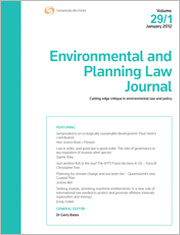 This article assays this important contribution to environmental law. In Australia, invasive alien species (IAS) are the second largest threat to biodiversity after loss of habitat. International obligations provide that Australia should prevent the introduction of, or control or eradicate those alien species that threaten ecosystems, habitats or species. Yet, designing and implementing effective IAS regimes remains elusive. It is a multidimensional exercise that engages a variety of actors across all levels of government. The purpose of this article is to examine complications stemming from governance of IAS regimes in federal systems where law-making power is shared. It is argued that Australia has created a governance system for IAS largely based on political compromises, and yet the federal government still has the opportunity of providing a national framework for regulation of IAS. However, the federal government has only partially grasped this opportunity, leaving the regime peppered with gaps and inconsistencies that fall short of its potential. Dolphin safe tuna fishing has often been the battleground for and catalyst of tensions between international trade and environmental interests. In the most recent contribution to this history, a World Trade Organization Panel decided that the United States dolphin safe labelling regime contravened the Agreement on Technical Barriers to Trade. This article examines the Panel’s reasoning and its broader implications. The Panel’s decision comes almost exactly 20 years after the first US – Tuna case, which was largely responsible for crystallising within the public mind the tensions between the international trade regime and the environment. Accordingly, the latest US – Tuna case merits close attention because it presents a convenient opportunity to reflect upon the World Trade Organization’s progress in accommodating environmental concerns. Climate change is projected to cause sea level rise, and an increase in the frequency and severity of extreme weather events. As most of Queensland’s population is settled in coastal areas, these events pose a major threat to development. The Queensland government has recognised this threat, and recently released a new Coastal Plan and associated legislative amendments. This plan seeks to minimise new development along the coast, and increase the resilience of existing development. This article will analyse the new regime for coastal management in Queensland, and conclude that it represents a positive step forward in safeguarding against the predicted impacts of climate change. Under current rules, rising sea levels could result in significant cuts to maritime zone entitlements, particularly those of island states. Jurisdictional uncertainty poses risks to offshore mineral exploration and exploitation activities, thereby depleting the income and other benefits generated by such activities to host states. Developing small island states, which are among the most vulnerable to sea-level rise and the least responsible for climate change (a key cause of sea-level rise) – and for who appropriate exploitation of natural resources provides an opportunity for development – have the most to lose in this scenario. This article examines a number of options to address this issue, both within current international rules and proposals for new rules of international law. The deficiencies of existing proposals, which have paid little attention to the implications of sea-level rise for offshore resource exploration and exploitation, are identified. Ultimately, this article demonstrates that a new rule of international law that “fixes” continental shelf entitlements would be the most efficient and equitable way to resolve this issue, thereby assisting small island developing states to preserve the benefits of offshore mineral resources to their peoples. For the pdf version of the table of contents, click here: EPLJ Vol 29 Pt 1 Contents.